The Acrocanthosaurus from the Schleich Prehistoric collection. 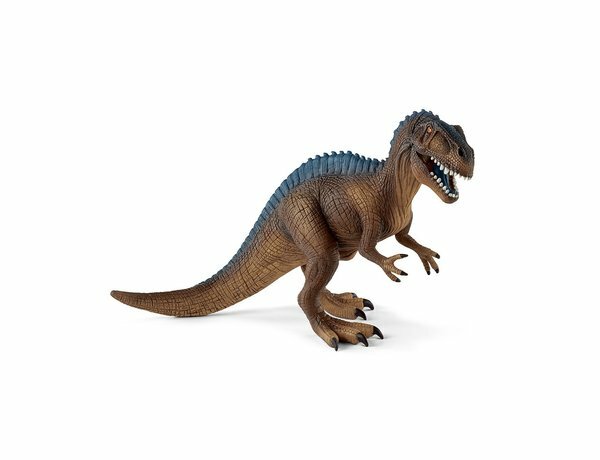 Schleich manufacture wonderful, amazingly accurate models of all sorts of animals, particularly dinosaurs including this model of the Acrocanthosaurus. All Schleich model animals are beautifully hand painted to give wonderful role play to children and are also great collectors items for the dinosaur enthusiast. These Schleich models give a wide ranging addition to a child’s imagination and education and offer great play value. The Acrocanthosaurus was around the same size and weight as the Tyrannosaurus Rex and Giganotosaurus. Unlike many other dinosaurs, it had seven openings in its skull rather than five. It also had lots of neural spines on its neck, back and tail, which probably formed a small “sail”.